Feijoada is such a meaty Brazilian dish that I never would have dreamed it could be vegetarianised if I hadn't been served it in a tiny vegan cafe. Oh, and it's pronounced fay-zwah-da, apparently, although the nice waitress didn't bat an eyelid when I asked for the fer-joe-der. Feijoada is a big hearty stew, traditionally made with black beans and fresh, smoked, and salted meats. This meat-free version uses veggie sausages and smoked paprika (and a heap of other yummy ingredients) to create a similar deep, bold flavour. Eat it with rice, cous-cous or bread. It's even nicer the next day, heated up for your lunch. 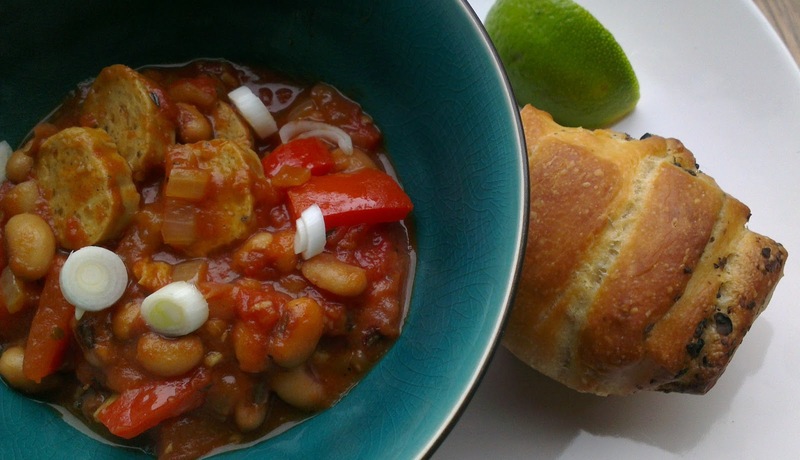 Add kidney beans to the black beans for some different contrast and flavour. Get an enormous saucepan. Biggest you can find. Bigger than your head. That's the one. Heat a little oil over a medium heat and fry the garlic, onion and pepper until soft. Add the veggie sausage and leave to brown for a couple of minutes. Tip in the beans, chopped tomatoes, paprika, cumin and thyme and bring to a simmer. Add the stock and bay leaves and just let it bubble away for about half an hour until it's really thickened up. Season to taste, then serve garnished with chopped spring onions, coriander and a squeeze of lime. Instantly bookmarked. Love a dish that uses kitchen cupboard staples. Oh yes, I should have pointed that out. Thanks for the excellent selling point! Drool. I've got food for the next couple days possibly but this is what I'm making when I go into the kitchen ext with my sleeves rolled up. Excellent! You could always make it in advance and let it sit overnight so the flavours develop (or you could just have a relaxing evening with your feet up). So I ended up making a variation of this and i was wonderfully hearty and warming. Variation because I used red kidney beans when I couldn't find black beans, I also had fresh thyme rather than dried and I used some dried oregano. I'm really looking forward to having the leftovers tonight. Your additions sound ace! Have you tried the hot paprika? That's got quite a kick to it. OMG, Rajma is my favourite comfort food! I'll make a note to buy hot paprika. I'm so pleased you enjoyed it! I'm half-Indian so totally understand the need for chilli, I throw it into everything because it seems as normal as adding salt and pepper. We made this an it was absolutely delicious. We used one yellow and one red pepper and a mix of black beans and kidney beans and six veggie sausages as my boyf has a big appetite so that way it lasted us two meals. Ate it with French bread and it is now one of our favourite meals!